Most offset umbrellas will not come with counter weights, in this article I will give you some solutions on How to Secure an Offset Umbrella in your patio area. The type of base will be the first thing that will be a determining factor that will lead you to the right weights for you. 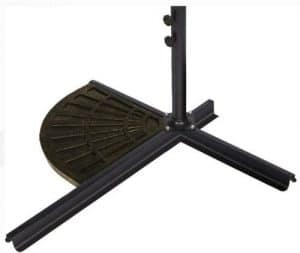 Most offset umbrella bases will be in a plus shape with a ribbed design that will secure your weights. You can use large paver concrete slabs, they are not the best looking or a bag filled with a heavy media like sand. Both methods will work well if used properly, the bag will look better and be safer if someone falls near the umbrella base. Almost all offset umbrellas will not come with counter weights for a proper balance, this will be additional cost to this type of purchase. Lets see why you need counterweights. The design of an offset umbrella will be having an umbrella that can hang over a sitting or dining area without a central pole. The pole will be on the side with an arm that will extend out for the umbrella to hang from. 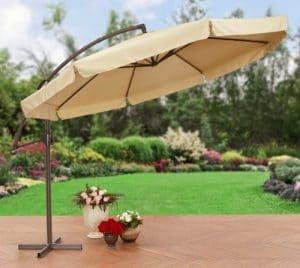 The advantage of this type of umbrella is that you do not have an obstruction in the middle of the table. The other case is that you do not have a table with a hole for an umbrella, like a conversation set. Most coffee tables will not support a market umbrella. 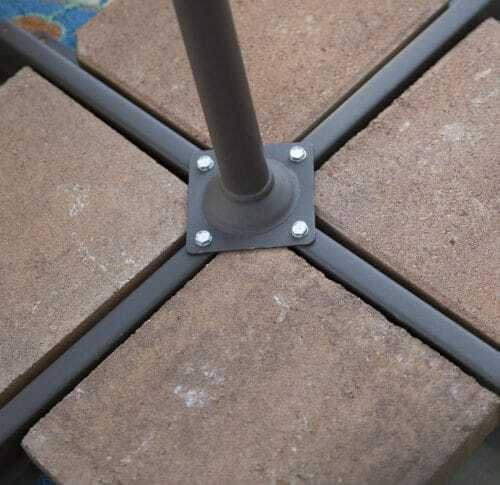 With the offset design, the base of the umbrella will have to be secured to the ground with weights or permanently mounted secured to a ground surface. If you do not have weights or not secured to the ground your umbrella will not be stable when opened. Now lets look at the kinds of weights available to secure your offset umbrella for use. If you would like to look at some of my offset umbrellas, see my post here. I even have a review of an offset umbrella with a screen to keep out bugs, see an article here. Two major types are available today, stone weights or media filled weights. Each can stabilized your offset umbrella by sitting on the arms of the base. The amount of weight that you need will be in the manufactures recommendations. Your results will may vary with each of these solutions, follow the instructions for your umbrella. This four piece set will give you up to 140 pounds of weight to counter balance your umbrella. Each piece made form a heavy duty plastic material, will hold 4.2 gallons of water that will be filled through a fill spout. At 8.3 pounds per gallon this will give about 35 pounds for each section. When these four sections are put on the cross type base they will make a almost square pattern. The top of each piece will have a decorative design. The base will be 20 inches from the corner, 20 inches from outside corner to outside corner and 3 inches thick. The big issue with this type of counter weight is the water fill. When the weather turns cold, under 32 degrees, they will have to emptied to avoid being damaged beyond any further use. With a little work, you could fill this umbrella base with a medium like sand, this may take a little time with the small hole for filling. Sand bags can be an easy fix for umbrella counter weights. These bags in a set of two (four are recommended for each umbrella) can hold between 44 and 60 pounds of sand or other rock type medium. Water cannot be used with this counter weight. 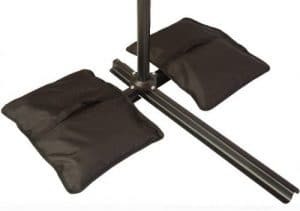 Just place one of these filled heavy duty cloth type of material filled with your favorite fill material on each leg of the base. Each bag will have a zipper for easy filling or emptying of your medium. Bags can be easily removed when you need to move your umbrella for storage or change of location. You should use four bags for proper counter balance of your umbrella. This round heavy duty fabric is coated with a weather proof polyurethane coating will have the ability to wrap around the pole base and sit on all four of the outriggers on the umbrella base. Will fit post up to 3.5 inches. Flaps will open on top to fill with a medium, most will use sand or a very fine rock. Your bag will have a carry handle to help get your bag to a storage area when empty fro the winter months. The bag will be 18 inches across and 5.9 inches tall and can hold up to 90 pounds of medium, most use sand. Uses a snap lock to secure the bag around the post. Can be used with any umbrella that has a flat base. These pie shaped pieces will give you 26 pounds of counter weight per piece. Each piece will be made from a bronze colored resin material, this material will not rust or discolor. The 26 pound piece will be 19 inches from the corner, 26 inches across the fan and 1.5 inches thick. Top of the base will have a sunburst design for a better look. This base can be purchased in singles or in sets of 2, you will need four to complete what you needs are for an offset umbrella. This will give you a total of 104 pounds of counter weight. No provisions for holding the weight on the umbrella base. This counter weight is made for the cross type of umbrella base, will not work with a round flat base. 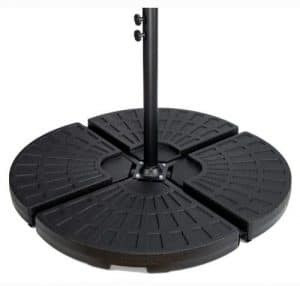 Each weight will have a carry handle for moving when you need to move your umbrella or want to store it for winter, this makes the 26 pounds counter weights easier to move. These stone counter weights can be purchased at any local home improvement store or landscaping supply. Available in many sizes and weights, you will have to determine what works best for you. Some will have designs on them and they can be available in many colors. If you purchase plane stone weights, they could be very unpleasing to the eyes compared to some of the other counter weights in this article. Total cost of this kind of weight will be less than others. They will be hard to move when needed as they have no way of making them weigh less and they will have no handles. Corners will have some sharp edges if a person was to fall on them, serious injuries can occur. Many will use this type of weight for an easy way to balance their offset umbrella with great results. 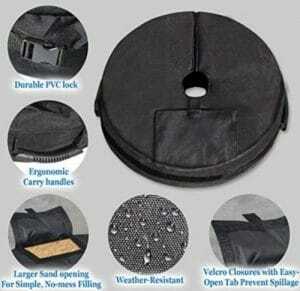 Depends on your method on How to Secure Your Offset umbrella, each of these bases can work. I prefer the sand filled models for the better look, they are safer with no sharp edges and you do not have to empty during freezing weather. I have filled my media umbrella base with sand for years without having one of them fail because they spit from freezing weather. If you spend good money for an offset umbrella, I would go with a filled base for the extra safety and the ability of ease of movement. Any questions or experience with a umbrella base like one of these, use the forms below and I will get back to you shortly. Article is very nice ordered with appropriate illustrations, I’m sure that many people will find it helpful. Keep up with god work John! I do not use the water filled umbrella bases, they tend to leak and you have to make sure that they are empty when the weather turns colder. I like the sand filled the best, then the concrete. Thanks for your example to share with my readers. Wow, didn’t know there are so many different kinds of weight for Offset Umbrella. I am new to Offset Umbrella product so your post is refreshing to read for me. Thanks for sharing. There are many ways to keep your patio umbrella in place. Some will work better than others, each person will have to decide what they are going to do to protect their investment. Great tips. I have similar problems with my umbrella every year. I tryed to put a lot of things to hold it, but when the weather get angry, I am always running thru my yard to catch it. The problem with keeping a dog from chewing on it will be similar to other rodents that live outside. You must put something on it that their taste buds do not like. I would try just a plain pepper as most animals will not eat stuff with pepper on it and it will not hurt them. The weight is not that much different, maybe a pound or two. The water systems will be easier to fill and empty, they need to be emptied before any freezing weather. Moving an offset umbrella takes a little more work than just moving a market umbrella, it will provide much more sun protection. I really enjoyed the post. Thank you for telling how to keep my family safe when using a patio umbrella. I did not know you needed weights to hold it place. The stone looks good. Your article was very thorough with your details. Thank you kindly. Just trying to help those who don’t know. I am glad you found this post helpful, if you have any questions please let me know. Great information here. I have one of these umbrellas. It came with a bag to fill with water, but it wasn’t heavy enough to hold down the umbrella, and it kept flipping over. The bag was nearly impossible to fill with another substance such as sand. So, we bought some sand bags to hold it down. However, they are not very nice looking. I didn’t realize there were ll the options you presented here. Thanks for the help! Getting the right counter weights for your patio area can be tough at times. Having a water filled one is the easiest way and takes the most time when you need to empty during the cold months or want to move your umbrella. If you need any more help let me know.